James Thompson, who is at Bristol University, ran in this evening 5k road race and finished an excellent second in 16.14. James finished just five seconds behind the winner, Callum Jones, of Cornwall AC. More good news this week was received from Jack Keywood, who is at the University of East Anglia. 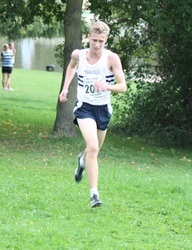 Jack is back into his running and has emailed an update for the Distance Runners Diaries 2013 page. Four TAC athletes underwent some performance testing at Canterbury on Monday. See some video clips on the Training Completed page. Sean Molloy, Corey De'Ath, Tom Cox and Alice Wood should receive their reports towards the end of the week. Alex and Tom have sent in updates over the last couple of days to let us know how their early days at university are going. You can read about them on the Distance Runners Diaries page. Sunday - Great South 10 miles race at Portsmouth - 28th Dan Bradley 56.17, 29th Julian Rendall 56.18, 32nd Ben Cole 57.19. Approximately 25,000 starters ! TAC may be 3rd team. Photo below of Ben Cole, Dan Bradley and Julian Rendall at the Great South Run. 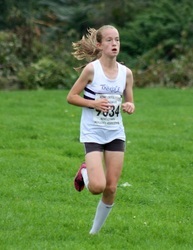 Under 13 girls 1st (2nd Kelsi Cornish) 10 runners in top 15 ! 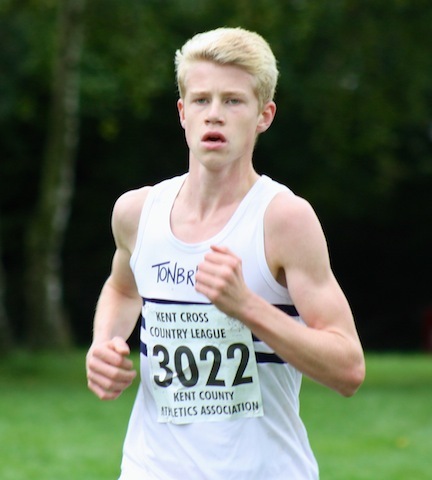 15 athletes is a record number of TAC starters in a Kent League). Note – Agnes McTighe ran as a guest (lives in Switzerland) in a TAC vest and won the race. She is a cousin of the Nicholls family, although not a TAC member. Senior Women 1st (3 to score) (1st Miranda Heathcote, 2nd Nicole Taylor). Also won 6 to score vent and 13 athletes was a senior womens race TAC record. 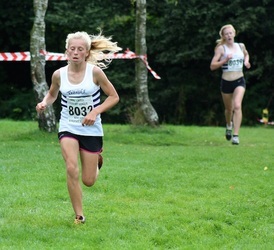 Photo below of the record breaking under 13 girls squad who had 10 athletes in the first 15 home. 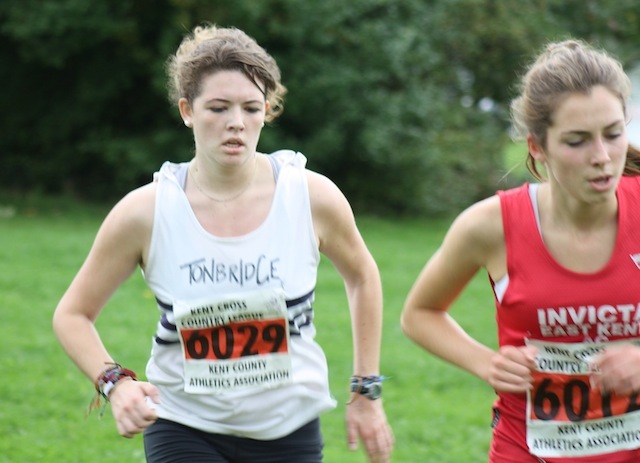 Photos below - some of the action from the Kent League, including Nicole and Miranda leading the senior womens race. There were 81 entrants for the junior 1 mile races, held on the fields at Tonbridge School. 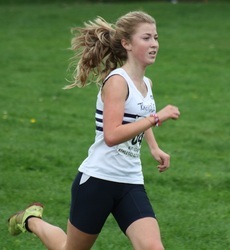 TAC's Lizzie Miller was the first girl home in around 6.10 and Finn Croll was second in the boy's race, as about four runners dipped under six minutes. Full results are on the Results 2013 page. On Saturday morning Graeme Saker (over 50) finished 2nd in the Maidstone Parkrun in 17.23. 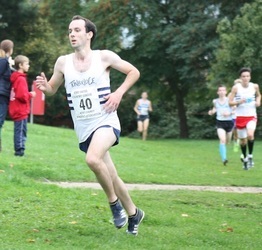 On Sunday morning, Dominic Brown, who is at Sheffield University, finished 2nd in the South Yorkshire Cross Country League fixture. Full results are at http://www.sycaa.co.uk/uploads/59/c9/59c9eb7c00deb6ca9be8575ed12782cd/Clifton-Results.pdf and also posted on the Results 2013 page. Also on Sunday, Sam Bradley won a half marathon in Ilinois, USA in 71.58. See the following link to an article in the local paper. We had about 40 athletes training at One Tree Hill on Saturday morning. Details are on the Training Completed page. Most who attended are in the photo below. There were three TAC athletes running for their universities at Parliament Hill. The event is quite low key and many of the athletes use it as no more than a training run. Robbie Farnham-Rose was 3rd, with Ryan Driscoll 13th and Chris Lloyd 29th. Full results are on the Results 2013 page. Other weekend news 12th/13th October. Joe Watts ran 43.50 to finish 57th in the Petts Wood 10k on Sunday, which was outside his pb, but apparently the conditions were horrendous. Distance Runners Diaries - a quick update received from Charlie Joslin-Allen, from Iowa, USA. 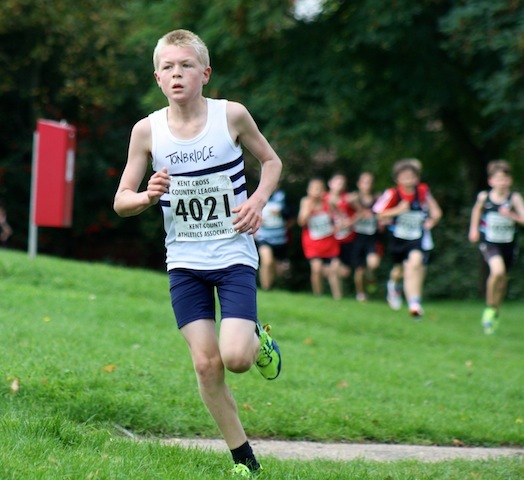 Under 15 boys race video now loaded ! The rain was lashing down from the moment that we arrived until about 3pm, but the team spirit was excellent. It was good to see so many athletes and supporters cheering others on. The under 15 boys excelled in winning, but there were plenty of encouraging performances. Toby Ralph had been moved into the under 17 mens A team, after George Duggan withdrew (ill), but suffered a bout of chest pains that slowed him dramatically. A top six or seven placing was on the cards there aswell. Photos below starting with u15 boys team of Jamie Goodge, Alasdair Kinloch and Tom Kendrick. Tonbridge AC qualified two mens teams to the championships for only the second time ever and they finished 22nd and 37th from 78 finishing teams. Full results are on the Results 2013 page. 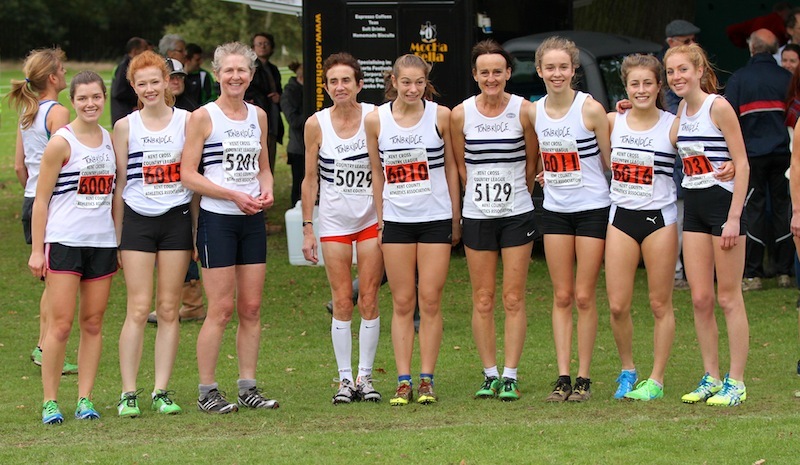 The 22nd place equalled the best ever performance, achieved in 1996 (the 2012 team was 12th at Clumber Park, but the race was weakened, having been swiftly re-arranged). It was a solid performance and the two teams we had put in a big effort. It was just unfortunate that so many had been suffering a bit with colds and/or were only just getting fitness back. The fact that we had the fifth B team home shows the strength in depth is growing. At the Schools at Somerhill there was an IAPS (Independent and Public Schools) event, where there were wins for Charlie Crick, Vita de Munck and Rebekah O'Brien (soon 11 years old and can compete for TAC). Full results are on the Results 2013 page. John Harley is due to race in Chicago on Sunday. We wish him well as his last experience was in Boston, where he missed the bomb attack by about half an hour. Peter Laing was first home in the 15-17 age group at the Forest Row 10k, running a very good 38.55. Calum Laing won the 11 to 14 5k in 21.01. James Thompson (pictured here with Nicola Wilkinson) has sent through a quick update of how he is getting on at Bristol University. 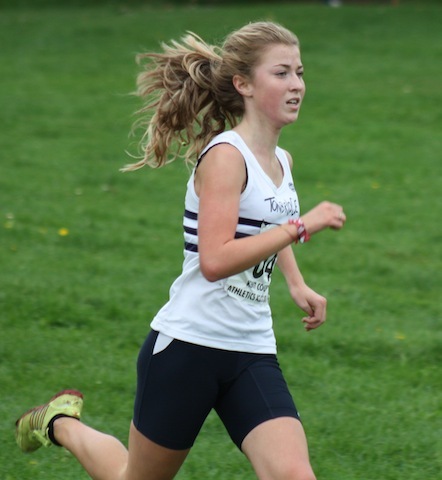 See the Distance Runners Diaries page. I just wanted to say a massive thank you to all associated with TAC who provided us with such fantastic support around the course during the races at Swanley Park today. Running up the hill through a corridor of noise, much of it made by those supporting TAC athletes, was an amazing, inspirational experience. Thank you everyone.